Ford utes and trucks have been doing the business for plenty of decades now. They are normally a satisfying drive, combining nice handling characteristics with good levels of comfort. These new Ford Ranger models boast an 800mm wading depth (high riding Ford Ranger models), greater leg room and are big on safety. Ford Ranger utes are very modern, quiet performers. Power is particularly good in models with the 3.2-litre diesel engines. Definitely a class leader, with no less than 470 Nm of torque available between 1500–2750 rpm. Grunt of this kind is an attribute that allows the new Ford Ranger to tow a braked trailer weighing in at well over three tonnes. The Ford Ranger XLT is loaded with treats. Voice control and dual-zone climate control come as standard. It’s hard to overlook a new Ford Ranger. It’s quite possibly the most practical ute that money can buy, and it’s also one of the plushest. O.K, where are all the guys who wear denim jeans, shave every 3 or 4 days, and have hairy chests? This one’s for you. And, by the way, the girls love them too – the new Ford Rangers as well as the guys! The latest Ford Ranger is very much a work truck that can tackle the hard yards in its stride. Crash through weather-beaten terrain and eroded forestry tracks, and you’ll find that this baby can take the rough with the smooth. There is nothing more necessary then running gear that has the “don’t mess with me” attitude when a hard working bloke needs the best that a ute can offer to get out of a tight and often steep or slippery situation. The Ford Ranger is one vehicle that is capable of tackling the worst on and off road conditions. And when scrubbed up, the Ford Ranger looks as good as a “Mills and Boon” millionaire sheik. The Ford Ranger looks rugged and well built, and is always ready for work. The agreeable exterior provides a purposeful and sporty look which will appeal to most tastes. Rugged and yet sophisticated, the new Ford Ranger seats up to five large adults in relative comfort. Power has risen further with the introduction of the new model, and positions the Ranger as a class leader in the power stakes. Big performance means that the Ford Ranger is an enjoyable drive. Stopping ability is provided by large disc brakes boasting the latest ABS technology, while the new Ford Ranger chassis is more than up to the task of providing great control and excellent grip on a quick squirt over the winding country roads. Three engines are available. Firstly, the 2.2 litre high-pressure, common-rail turbo-diesel is a modern engine design. The new 2.5-litre diesel engine gives excellent fuel economy at around 7.5 litres/100 km – yet you’ll still have 375 Nm of torque to play with from as low as 1500 rpm. The biggest of the three engines is the all new 3.2-litre diesel. Intercooled direct Injection turbo-diesel technology provides massive performance which delivers 147 kW of power at 3000 rpm and a thumping 475 Nm of torque from between 1500–2750 rpm! A combined fuel economy figure comes in at 9.5 litres/100km. And if petrol is your preferred fuel choice, then you’re going to enjoy the quiet 122 kW, 2.5-litre versions. Simple, modern technology and superior reliability make this a ute for the hard working. For those of you that consider performance to be a top priority, the 3.2-litre diesel gives its Ford Ranger models a huge leap off the line. This acceleration quickly turns into swift motorway speeds which eat up the miles with style. Ford equip their new Ranger models with a range of transmissions and variants. Essentially, you can buy a new Ford Ranger with one of the following transmissions: a five-speed manual, a six-speed manual or a six-speed automatic transmission. If you opt for the cheaper five-speed manual models, you’ll have assured and smooth gearshifts. A perfect link to the Ranger’s excellent torque delivery can be accessed via six-speed manual versions when and how you want it. And for those of you where an automatic transmission is a must, the six-speed auto is a silky gem. The automatic transmission features closely spaced gear ratios to help produce better acceleration under full throttle, while optimising the, all important, fuel economy figures. Towing is a Ford Ranger strong point, and you’ll find the gear ratios offer superb throttle response when accelerating, towing a trailer or caravan, or driving in testing off-road conditions. The Ford Ranger handles rugged terrain with confidence. Even on the rough stuff, the occupants still have a commendably smooth ride. This said, the Ford Ranger offers very powerful performance off-road. The high ground clearance enables the Ford Ranger 4×4 to clear ruts and obstacles easily. And when it doesn’t, skid plates shield the under body from what otherwise could eventuate in serious damage. Four-wheel-drive can be engaged even when travelling at highway speeds. Low ratio gearing is standard on the 4×4 and, when engaged, grip levels become limpet-like. The new Ford Ranger is a diverse ute that offers a wide range of options. A regular Single Cab, Crew Cab and Dual Cab options are available. There are two-wheel drive and four-wheel drive models available to match you choice of body shape. Inside the Ford Ranger, the interior, whether a little muddy from work use or clean, is a pleasant place to spend plenty of hours. All engines are well muted, leaving the cabin with a level of refinement other work vehicles could only dream of. The Ford Ranger XLT adds chrome trim, interior luxuries (including a CD player, tilt wheel and full carpeting) and useful truck accessories (rear step bumper, sliding rear window, mud flaps). The Ford Ranger XLT 4WD models get step bars and fog lights, and it looks fantastic sitting on 16-inch aluminium wheels. 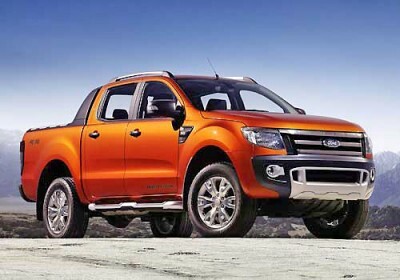 More luxurious items are available at a price, depending on which Ford Ranger model you care to purchase. For the guys who love to get way Outback, the Ford Ranger WidTrak will rock your socks. This mean Ford Ranger can be equipped with heavy-duty shocks, skid plates, limited-slip rear differential, and eight-hole Alcoa forged aluminium wheels. The bucket seats are an added bonus for the serious off-roading man and woman! Enjoy! For any more information on the Ford Ranger or, for that matter, any other new car, contact one of our friendly consultants on 1300 303 181. If you’d like some fleet discount pricing (yes even for private buyers! ), we can submit vehicle quotes requests out to our national network of Ford dealers and come back with pricing within 24 hours. Private Fleet – car buying made easy!